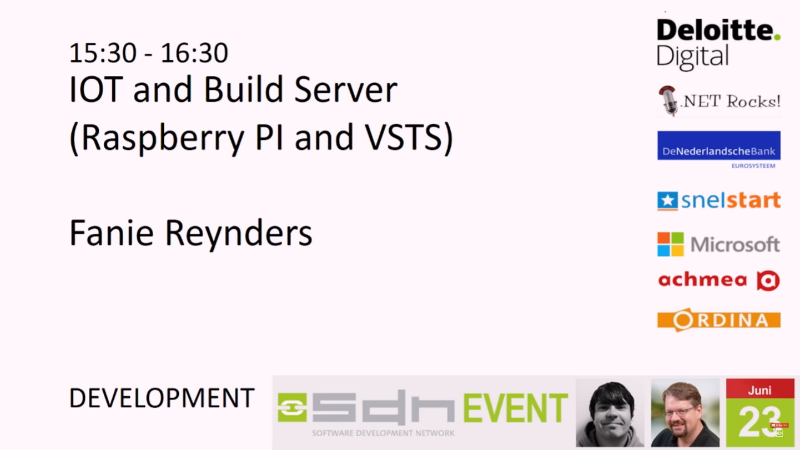 Last Sunday we published the third recorded session from our October SDN Event. It was the second session by Ted Neward titled “Busy Developer’s Guide to NodeJS”. If you (still) don’t know Ted, more reason to watch, he’s a real storyteller and has no problems to hold your attention for the full hour. A joy to listen and learn at the same time. Don’t forget to subscribe our YouTube channel, especially if you don’t want to miss our next published session recordings of the SDN Event(s)! SDN Event: Bill Ayers – Welcome to the Brave New World of SharePoint and Office 365 Development! Second session in our series of October SDN Event recordings we released the first presentation by Bill Ayers from the event where he informs you about the evolution of SharePoint and Office 365 Development and where we are today with regards to these products. Don’t forget to subscribe to our YouTube Channel so you won’t miss the next sessions that we are about to post soon! 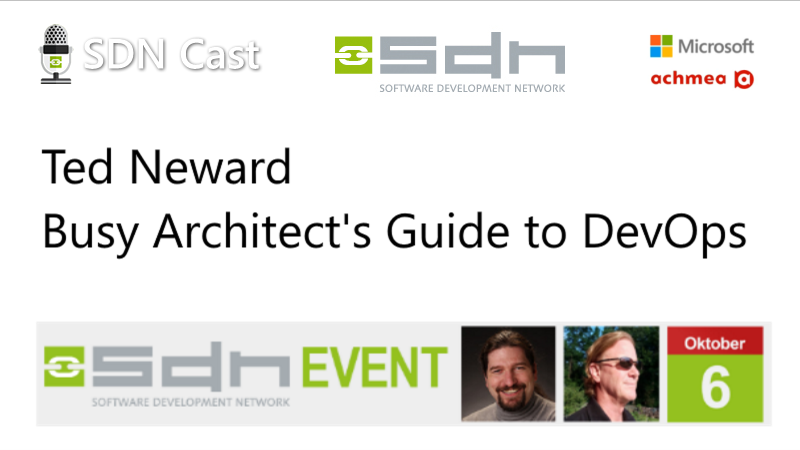 Due to the third SDN Event last week on Friday October 6th we were a day early with our weekly Dutch SDN Cast. Usually we broadcast on Thursday but this week we had to shift things a bit, so we broadcasted on Wednesday. As usual we pick up our foreign speakers from the airport the day before the SDN Event and bring them to their hotel to stay the night. You can’t ask the presenters to travel large distances all on one day, can’t you? For this reason, we moved the SDN Cast a day earlier and didn’t skip the web cast because you don’t want to miss the weekly news either don’t you agree? News just goes on and on, SDN Event or not. And news there was … a lot of it! Besides the annual hardware event by Google there was the Microsoft Mixed Reality event the day before. Would it be a coincidence? Microsoft’s event was completely focused on Mixed Reality announcements. Some sort of a special on Mixed Reality headsets, HoloLens and MR software. Other than the already announced headsets Microsoft this event showed off the new Samsung Mixed Reality headset that will become available soon. But more important was the vision Microsoft showed us with regards to the Mixed Reality future developments. All available in the soon to be released Fall Creators Update. With this Fall Creators Update Microsoft will also include the Windows Mixed Reality home – the Cliff House. In this virtual space you can move and design the spaces with your apps and holograms. Another thing that was announced is that Microsoft acquired AltSpaceVR and the SteamVR catalog will soon be available from the Mixed Reality world of Windows. Currently already available for developers in Preview. Somewhat later, the day after, Google held its annual hardware event. Many of the details already leaked as we discussed last week, but now we officially were introduced to the announcements and no need to speculate over the details. A whole slew of new devices, the new Pixel 2, Google Home, Google Buds, Google Clips and the new Chromebook to name a few. For both events I’ve added the links in the show notes below in this article so you can go back and watch the events again. 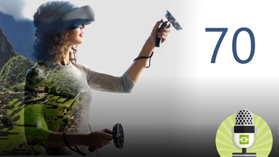 We haven’t decided yet what day we will go live with SDN Cast 71, maybe again on Wednesday but another option is live from the TechDays event in Amsterdam. Go to www.sdncast.nl for more information on the exact date and time. Where can you find our 70th episode of our Dutch SDN Cast? Did you subscribe our Dutch SDN Cast channel already? Subscribe your YouTube channel if you don’t want to miss a single broadcast. Usually we will broadcast on Thursday evenings at 8 PM but there can be a change of plans where we need to move to another time or day. So to be sure Subscribe to our channel on YouTube or go to http://www.sdncast.nl to see when the next episode is due. As usual we are always looking for presenters for our own events and Meetup’s so if you want to share something about hot technologies or just about something you implemented at work or in an App that could be interesting to our audience let us know so we can schedule you for one or our next SDN events or Dutch .NET Group Meetups. This off course also goes for if you want to write a great article for us to publish in our SDN Magazines or at our SDN Website. The downside of publishing a magazine article is that there can be sometime between writing the article and publishing the magazine. So, if it is time critical sometimes the best option is to publish it on the www.sdn.nl website to get more speedy attention to the article. As you see, options enough to address your audience with top notch information. 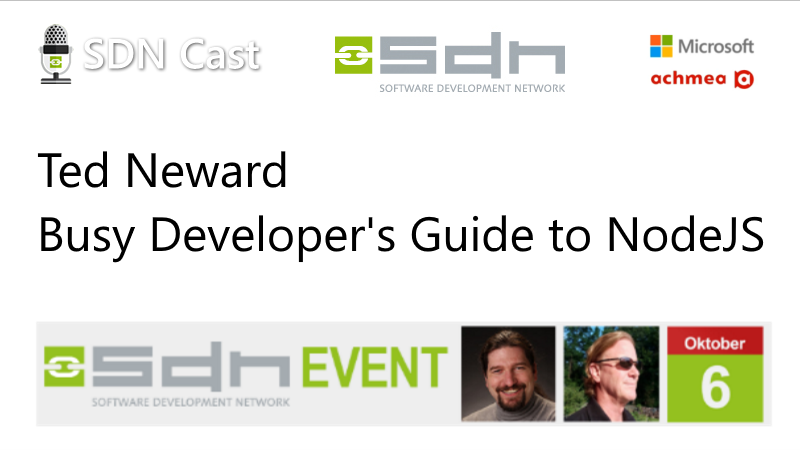 You can even, if you like, be our guest in our SDN Cast shows to discuss the projects you are working on or other topics you master. We will instruct you how to connect with us and what it is you need to join the show. Hopefully we will see you at our weekly web cast, for the schedule go to www.sdncast.nl for next week’s announcement to find out the day and time of our next broadcast or go to www.sdncast.nl/youtube to watch old episodes and videos that we recorded at our events. Don’t forget to subscribe our YouTube channel www.sdncast.nl/subscribe or go directly to YouTube not to miss any of our shows! As usual (by now) , we will put some of our SDN Event sessions online on YouTube for the next couple of Sundays. The first session that we recorded last Friday was the session by Ted Neward, a popular presenter from the Seattle Area (USA). If you watch the presentation you’ll see why. "Developer Operations", or its more commonly-known nickname, DevOps, has taken the industry by storm. Everywhere you turn, everybody wants to be doing DevOps. It’s the new black, the new normal, the thing that everybody clearly represents the next pinnacle in software development…. Except not everybody agrees on what it is, how to do it, or what benefits it will even provide you. In this presentation, we’ll deconstruct the whole "DevOps" movement, talk about what it really represents, how to get started with it, and perhaps most importantly of all, talk about what is realistic to expect out of it once you have actually managed to "DevOps All The Things!" within your company. The last recording in our series of SDN Event recordings that we publish from our 23rd of June SDN Event. This is the session by Fanie Reynders. Interaction with VSTS and a Raspberry PI in this recording called “IOT and Build Server (Raspberry PI and VSTS)” will show you a sample of what you can do with IOT today. Tired of the endless alerts spamming your team channels (especially e-mail) about the status of failed and successful builds? In this session, we are going to make use of Azure Functions, your favorite source-code repo (like VSTS) and a Raspberry Pi to create a simple lamp indicating the status of your builds on each check-in. Learn about how you can connect events driven from the cloud to the physical world using awesome tools available right now. Fanie builds an application, loads it on the Raspberry PI and all of this in a session packed with code, explaining how to interact with the small IOT devices in a real life working demo! Well wa’do you know! Recordings previously released from the 23rd of June SDN Event. With the introduction of .NET Core, many developers who have previously been married to Windows to do their .NET development are now investigating other platforms. By the same token, many developers familiar to the Mac who have been unable to use .NET are now interested in trying it out but aren’t sure what tools they’ll need. This session will target both audiences and take an intermediate-level tour of how to get started developing .NET applications on a Mac using Visual Studio Code and a series of command-line utilities and extensions. We’ll also investigate how the Azure Tools Extension for Visual Studio Code can be useful when paired with the Azure Portal’s in-browser tools to make developing your Web, Mobile, and RESTful APIs on Azure easy, and how Azure Containers and Docker can bring true portability and flexibility to your DevOps story. 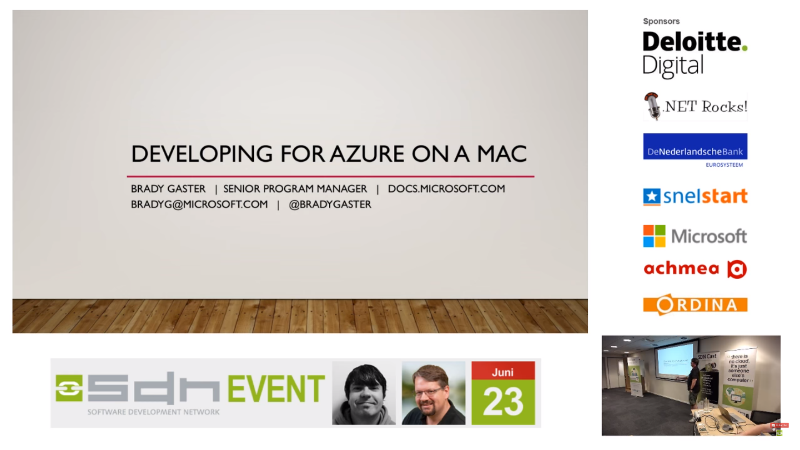 Brady takes you by the hand and shows you the tools you need to develop .NET Core and Azure solutions using a Mac. Using Visual Studio Code and the Azure Tools Extension for Visual Studio Code he goes through his ‘hands-on’ session packed with demos and only a few slides. A joy to watch! In our series of SDN Event session recordings we published today our third session from SDN Event June 23rd. This session is the second session by Richard Campbell that day titled “Saving the World One App at a Time”. Mobile and cloud technology are changing the business world – how about disaster response? 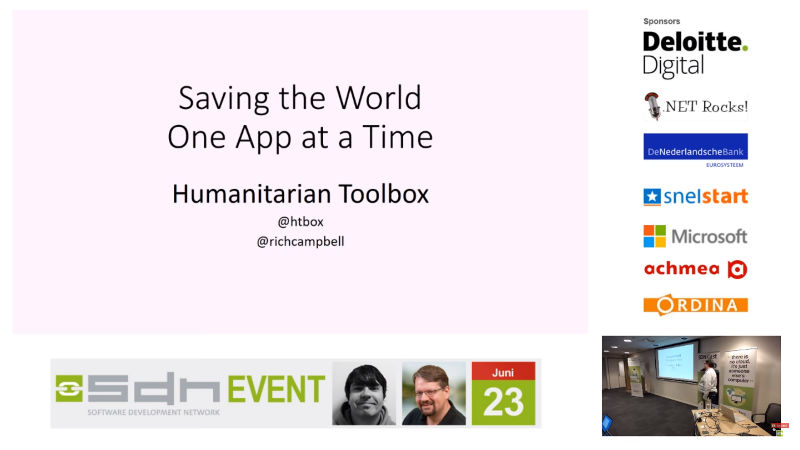 Join Richard Campbell as he tells his story of software, hardware and charity that ultimately has led him to the Humanitarian Toolbox (htbox.org). The Humanitarian Toolbox is an open source initiative to build software for disaster relief – both for the Non-Governmental Organizations that are involved in disaster relief, the citizen volunteers that donate their time to assist during a disaster and the disaster victims themselves. Richard will take you along on his journey of the convergence of mobile, cloud and open source software to help save lives. In this session Richard explained to us all about the Humanitarian Toolbox and how you can help by putting your efforts into a project that literally is able to save lives and help where it is needed the most in the world.